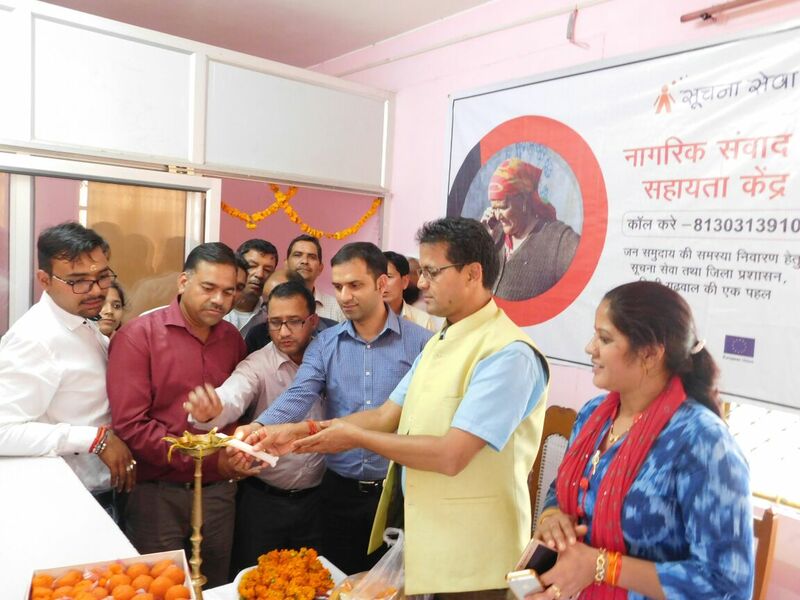 Soochna Seva launched “Nagrik Samwad & Sahayata Kendra” in Tehri Gharwal, Uttarakhand in collaboration with District Administration. The Chief Development Officer (CDO) ‘Mr. Ashish Bhatgain was very keen to have a system where grievances from ground can be heard by the concerned department and redress in a short period of time. The main idea was to lessen the efforts of beneficiaries coming all the way long to New Tehri to register a grievance related to any civic issues. Nagrik Samwad & Sahayata Kendra is a platform where a citizen can submit his/her grievances through a phone call. Citizens of Tehri Gharwal District can simply dial at 8130313910 and call the concerned Soochna Seva person (Soochna Sevak) to register their grievances pertaining to any of the departments or any entitlement or development or service delivery related grievances of the district administration. The NSSK center shall be considered as an extension outlet of the administration to collect grievances related to public schemes/entitlements and shared it with on-ground authorities of the concerned government departments to propel the application process ensuring quick relief and support to the beneficiaries. The Soochna Seva team shall be continuously in touch with the departments for the follow up and final redressing of the grievances and informing the same to the concerned citizens. A pilot shall be conducted for 4 months (Sep to Dec 2017) in order to see the impact and then taking it to the larger level. For the pilot, Soochna Seva Kendras of 5 blocks will work as the grievance collection points and forwarding them to the headquarters in New Tehri. The blocks are Chamba, Narender Nagar, Pratap Nagar, Thauldar and Jhakhanidar. After the pilot, the coverage will be gradually scaled up to the neighbouring Panchayats and Blocks with the support of the district administration.